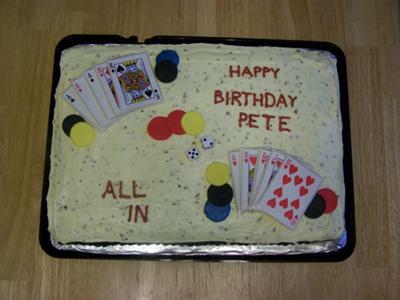 to make this poker birthday cake, I used a 13 X 18 rectangular pan. I used 6 cups of batter. This is a yellow cake, cream cheese and pecans icing, with a Bacardi 151 rum glaze. I used real playing cards, laminated them, cut fondant pieces to fit and glued them using the fondant and water as glue. For the chips I used different color fondant, cut them up using a top of a bottle and and using the same bottle make the ridges on the sides. Very nice job!!!!! It looks GREAT!!!!!!!!!!! That cake looks so good, the cream cheese and with pure rum in it, it is a hit for anyone. Love your cake, it is very pretty and yummy. Join in and write your own page! It's easy to do. How? Simply click here to return to Poker Cake.